The WHOI Tunnel Inspection Vehicle (TIV) was built in 2004 to inspect a 45 mile section of the Delaware Aqueduct and to, ultimately, find its leaks. 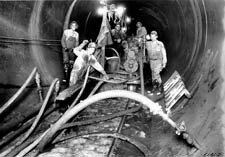 This was the first time that the tunnel was inspected while in use. 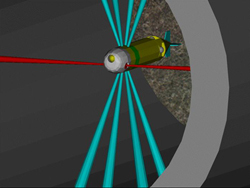 Acoustic Tracking of AUV in tunnel : What are the acoustic properties of a deep, drilled-in-rock, concrete-lined aqueduct? 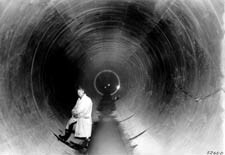 Optical Imaging: What is the best camera and light configuration for imaging the walls of the tunnel? 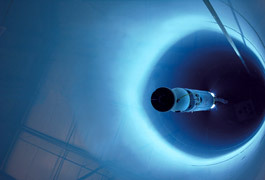 Vehicle Navigation: How do we insure that the AUV will fly in the center of the tunnel and not bounce off the walls? 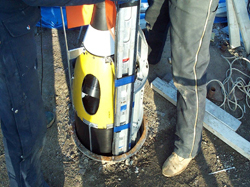 Launch and Recovery of AUV: How do we launch the AUV through small openings in 1000' deep vertical shafts at both launch sites? TIV contained 5 high resolution digital cameras and four strobe lights for illumination. Approximately 186,000 digital still images were taken, each containing telemetry information to indicate the exact position of the image to facilitate finding the location of any leaks.